We knew from the first time we met Amy and Steve that they were going to be a dream to work with. They are some of the most kind-hearted and fun loving people, and they are absolutely head over heels in love with each other. We were so pumped to kick off our 2018 wedding season photographing their day as they committed themselves to one another. You know the saying ‘Your vibe attracts your tribe’? That couldn’t be more true for this couple. They spent the morning surrounded by their respective friends and family, and let me tell you – they are seriously just as great as Amy and Steve. The girls got their hair done as they took turns passing around her bridesmaid’s brand new little girl, Ruby (superhero, right there, standing in a wedding after just giving birth). Amy was relaxed as she handed out gifts to her bridesmaids and stepped into her dress from Bridal Couture that her mom buttoned up for her before her friends and family surrounded her to pray for the momentous step she was about to take. Steve’s morning was much the same. 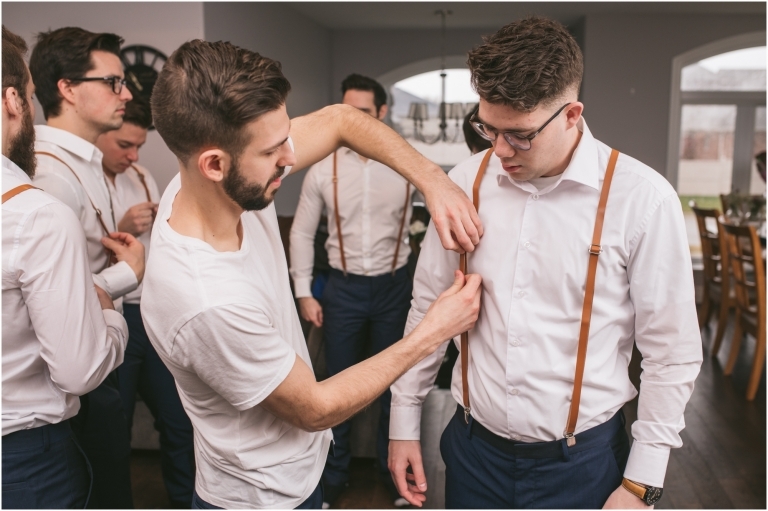 The jokes were nonstop as they helped each other with suspenders and bow ties, and posed for a few pictures of just the guys before heading off for Steve & Amy’s first look. As much fun as they have, Amy & Steve’s relationship is intentional and filled with faith in every aspect. 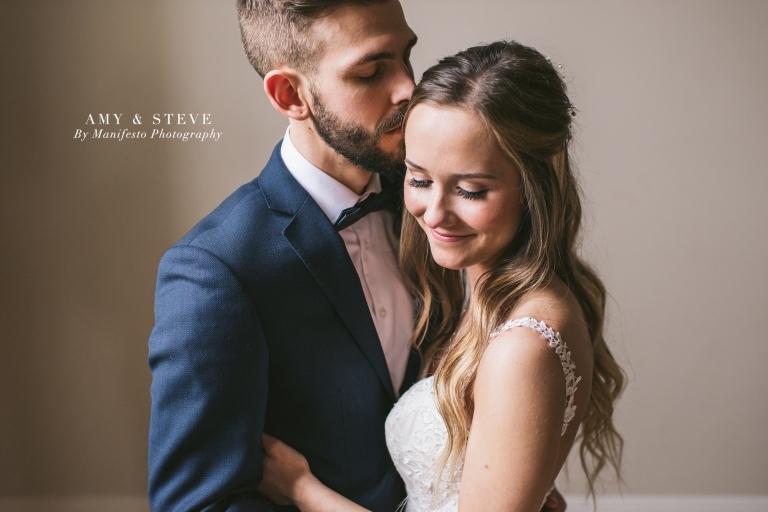 Amy had wanted nature for their first look and wedding party portraits, but as the day neared and the weather looked grim, they opted for an indoor location instead – Mackenzie Hall Cultural Centre. The location didn’t matter though as she stepped into the room for their first look, tapped on Steve’s shoulder, and shared in a hug and a look that clearly meant they could not be more excited for their day. And once the excitement of their first look had settled, they joined hands and prayed together, thanking God for each other and asking Him for his presence in their marriage. Their wedding party soon joined them. The cream coloured walls and subtle classic architecture of the room made for a neutral and timeless backdrop that complimented the bridesmaids’ rose dresses. The whole group of them are actually hilarious and good-natured. As you scroll below you’ll see their personalities shining through. Just as we were ending the photos inside, (angels sang hallelujah) the weather cleared up, and we were able to sneak out for some pictures on the grounds surrounding MacKenzie Hall – getting in that nature that Amy had hoped for. Their ceremony and reception took place at Windsor Christian Fellowship – the church where they had met and where they attended every Sunday together. The front of the room was lit up with dramatic lighting, and Steve stood up front waiting for his bride, as the room filled with those there to support them. Amy entered the room with her dad, walked down the aisle to her groom, and joined hands as they took the first step to becoming husband and wife. It was beautiful. Their reception soon followed. The hall was decorated with cream linens and light wood centerpieces filled with candles and flowers, and they made their entrance under a tunnel courtesy of their wedding party before they took their seats at the head table to thunderous applause. Their parents and wedding party took to the podium to speak into their marriage and tell stories about them individually and together before they opened up the dance floor with their first dance. Amy & Steve, it’s been so encouraging to get to know you and see your love and commitment to one another. Your character shines through and is even more evident through the many that came to stand by your side as you became husband and wife. Congratulations, Mr. & Mrs! “That’s the most beautiful thing in the world, when two people become fluent in choosing one another.” | H.B. Suit Shop: Stars, RW & Co.